To celebrate my 40th birthday, we headed to Ireland’s west coast, to spend five days exploring a few towns and beaches along the, frankly gorgeous, Wild AtlanticWay. At around 1500 miles long, the coastal route takes in nine counties along the north, west and south of the country. We flew Ryanair (who else for Ireland?) from Bristol to Knock, on the west coast, and because it was August - arrived during a torrential downpour. Mr S15S sorted out the hire car, while Mini and I waited in the dry; it was my birthday weekend, after all. We’d decided to spend a couple of days in the north-western coastal area of County Sligo (pronounced Sly-go, not Slee-go, as I kept saying), before driving towards Westport House, around an hour’s drive south-west, for the inaugural Harvest Fest country music festival. Yup, five-year old Mini was off to her first gig. And it was country. Recent AirBnB converts, we had two nights booked nearby Sligo (meaning shells in Irish, and plenty there were, too), and two nights booked in Westport. Well, who doesn’t love a bit of spontaneous adventure on holiday? It didn’t take long to reach our first accommodation. After a quick rest and chat about the local area with the fantastic host, we were beach-bound; the weather was slightly less torrential. In around fifteen minutes we reached the beautiful wide expanse that is Strandhill beach. And the parking was free! In Devon and Cornwall we’d have had to pay a few quid for an evening by the sea. The downpour slowed to a misty drizzle, so Mini was off climbing the beach rocks, giggling as the crashing waves seemed made purely for her entertainment. We opted for dinner in a local restaurant of Mini's choice - Chinese - and it cost as much as it had for Pete McCarthy when he explored western Ireland back in the Noughties. We then made our way back to our accommodation via the essential offie for a bottle or three. The next morning the rain was still with us, and we drove to the other side of Sligo, towards Rosses Point, another rocky beach, and, in the dry, what suggested a spectacular viewpoint. Mini had decided we were building towers, and although it was fun for the first ten minutes, the area was too wet and barren to really enjoy ourselves. So we did what anyone does on a rainy holiday and hit the shops in Sligo town centre. Hello Dunnes. That afternoon we opted for a boat cruise on Lough Gill - the inspiration behind WB Yeats' - Sligo’s poetical legend - The Lake Isle of Innisfree. Little ones can also explore the family-friendly Parkes Castle to extend the stay for half an hour or so, or while waiting for the boat. The Captain of the Rose of Innisfree gathered us all up in a warm sing-song of Yeats’ poems and Irish ditties, and brightened up a dull day with his vast and continual knowledge of the area. I'd highly recommend the cruise, even in the rain. Guess how much the parking was, too? Yup, my favourite price. 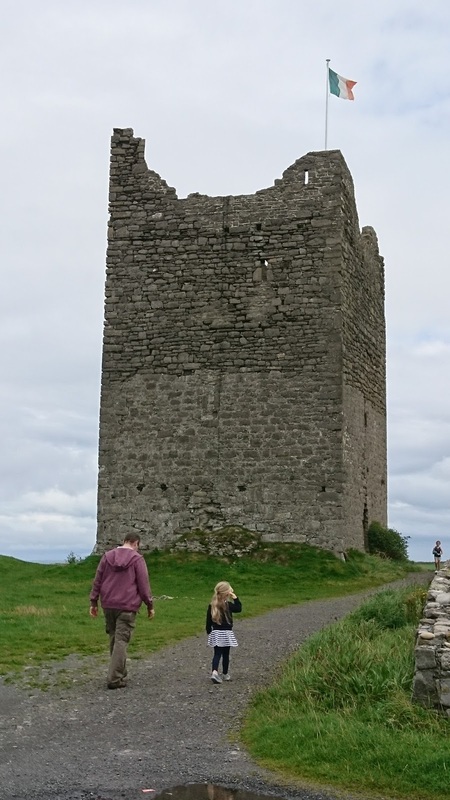 A TripAdvisor search revealed that Glencar Waterfall was only a ten minute drive away from Lough Gill, so we hauled Mini away from her castle worksheet colouring and back into the car, for more free parking at a spectacular tourist spot. Please note that nature should be free to admire, explore and learn from, Devon and Cornwall councils. 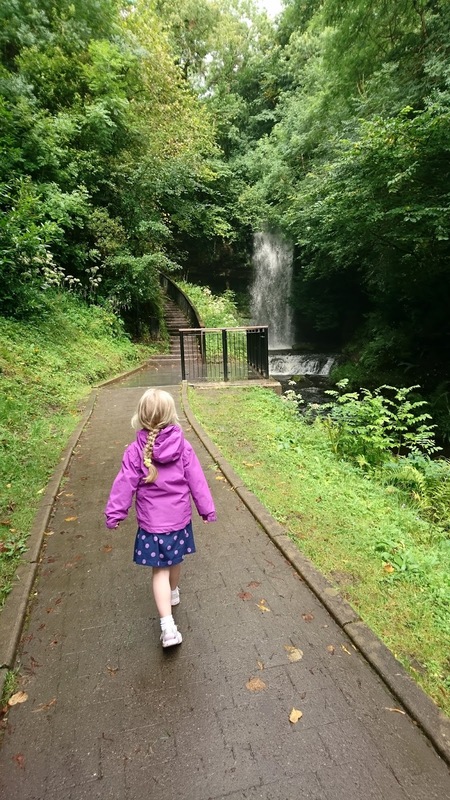 Although a small tourist attraction, there was a tea shop and playground at the entrance to the Glencar waterfall, so there was plenty for a lazy afternoon’s entertainment. We found our way to a pub for Irish stew (Mr S15S) and fish and chips (me and Mini) and then it was back to the guest house for the night. The following morning we drove west along the coast towards Easky, a designated Wild Atlantic Way stop, surfing haven, and home to the remains of Rosslee Castle. Again, drizzly, but perfect for Mini explorations and photos. 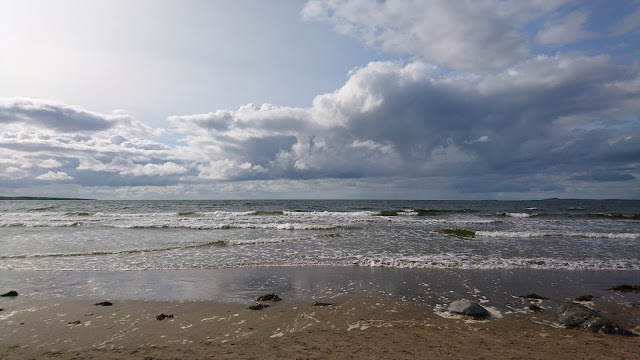 And because we had a car, and had just discovered that strand meant beach, on the way to Easky we happened up a gorgeous, and the almost deserted – in August - Dunmoran beach, and managed a good half an hour of dry before the drizzle made another appearance. Mini’s sandals were off faster than we could say go-for-it. After a quick lunch in the car we set off south, driving through Ballina and Castlebar, arriving into the pretty town of Westport, at the foot of Croagh Patrick (St Patrick’s mountain), around four pm. Plenty of time for a few photos, before heading off to find our second accommodation. Although the drive from County Sligo to County Mayo took only ninety minutes (and that was fifty miles), it took us almost as long to search for our AirBnB, over a five mile radius. Bit of a drawback of the accommodation service, especially in remote and unknown areas, where WiFI seems a bit baffled. Once we did arrive at the stopping point for the night, however, our host was super friendly, welcoming, warm, sincere - she offered us a tin of biscuits to enjoy with our coffee (take note, Hilton) and then drove us into the town (took about three minutes) to find dinner; much needed fish and chips. Then to the pub, where Mini practised her phonics with the menu (#proudmama). Westport was Friday-night ready for a good time, and the cider knocked the edge off the misplaced AirBnB. Mini was welcome in the pubs until about 9pm. We wandered outside onto the narrow, hilly, exuberant streets and found a sign for a taxi across the road. When we knocked, it looked just like someone’s house. Turns out it was. A bit of a natter with the owner and she rang her husband, assuring us he wasn’t far away, and offered Mini a biscuit. Mr S15S started to wonder how we were going to explain the route back; could I remember? Absolutely not - I’d had a beverage to celebrate my last night of being 39. But I found the AirBnB directions on the app, and showed them to the taxi driver. He took one look at the profile, said -sure, I know, Annie- and dropped us at the door a couple of minutes later. It was, thankfully, not raining the next morning, my actual 40th birthday, and my head was fine. Quick breakfast of freshly baked scones, and we were off to a day of country music (THAT’S how much Mr S15S loves me). 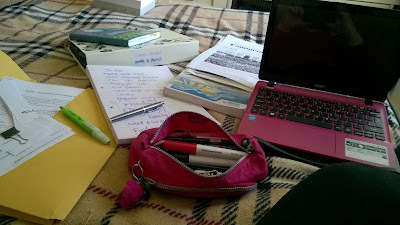 And what a craicing day(! ), if marred a little by a confusing late gate-opening, but the event staff were charmingly apologetic - they'd had to rope in a few local farmers to cover the unexpected mud with straw (how country can you get?). We spent the whole day at the front of the barrier, thanks to a lot of folks supporting County Mayo at a vital Gaelic Football match, met a wonderful lass from France - who I’ve since become good friends with - and belly-laughed as I watched Mini dance through the mud (when she wasn't sat on the barrier) revelling in a day of country music; will have to watch her as a teenager when it comes to long-haired bass players, mind. Had a chat with a couple of performers, and a cuddle from Kip Moore (#happybirthdayme) then pottered along to the taxi house where the fella recognised us and dropped us home for free. The next day, on the recommendation of Annie, we drove around the back of Croagh Patrick, on a well-known loop of Lochs towards Louisburgh, in an area known as The Lost Valley, testament to the 19th century potato famine. Unfortunately, we didn’t have time for the three-hour walking tour, but we were able to stop at the beautiful Aashlegh Falls. Cheers, Ireland, you were a great place to celebrate turning 40 – can’t wait to explore much more of the Wild Atlantic Way. Maybe even on a sunny day next time. I'd love to hear of your stories and plans to travel around Ireland; pop them in the comments below and maybe it'll spark off another round of exploration! I started with Galway city per say and loved to wander around Eyre Square, down to the Spanish Arch, the docks or the Salthill promenade. There is a very vibrant feeling in the air, I felt at home right away. You guys, Brits and Irish ;-), you sure know your way with pubs! :-) So I treated myself with a nice diner at the King Head downtown. It's a very charming and typical place (well … at least from a French perspective I mean) that can turn quite packed at rush hour, so may be anticipate a little. In addition I was lucky enough to be there for a live music night. I had a blast. My next stop was Oughterard, along the Corrib Lough shores, where I happened to arrive few minutes before the theatre night began at the local cafe. I was introduced to the very sweet and welcoming local patrons and had the most unexpected yet the most delightful evening, learning a great deal about Yeats and his muse. Pleasure and culture, always a good mix. 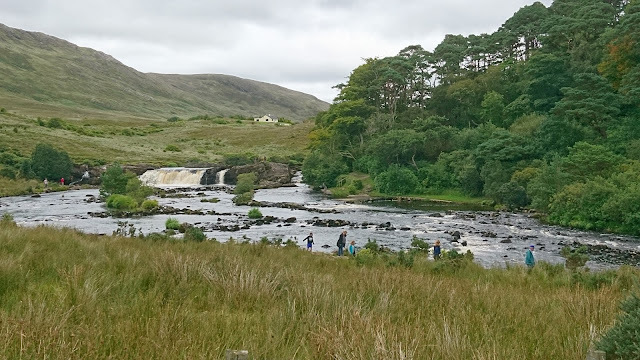 In Oughterard you will also find one of the departure point of the Corrib Cruises who offer several excursion options (I picked the one to the Ashford Castle). 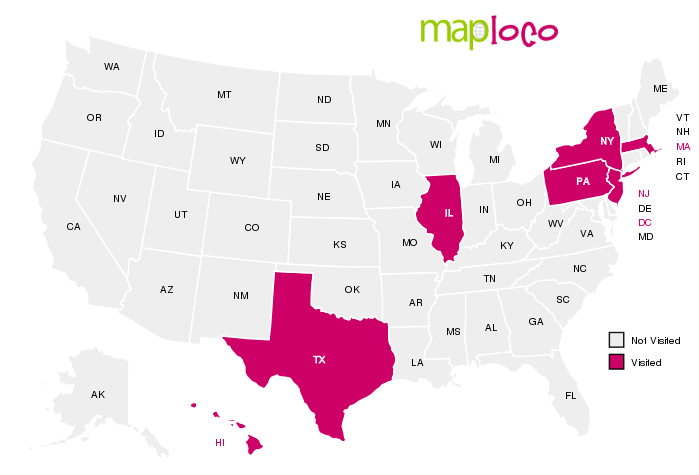 It's easy to book in advance by internet. I am not good enough in english or with writings skills so I do not find much words to translate how beautiful is this coast and how it feels among this rocky kinda solitary landscape at times. It was raining quite often but even like that it was breath taking. My pictures are crappy (which is why I bough photo books from a local artists) but I do not doubt that I will keep these memories very vividly. I found Patrick Pearce's cottage museum worth the detour (nice coffee shop too), together with Dog's bay with it's very surprising and impressive white sand beach engulfed in the rest of the dark rocks coast. I was not so much impressed by Clifden itself than by the sky road. Here again, breathtaking by lack of finding better wording. If you happen to be there on a sunny day, I would recommend renting a bike, there are plenty of places to do so. Suffice to say that I drove as fast as I dared to the hotel to change clothes without even a glance at Kylemore Abbey or the Killary Sheep Farm which were on the TO DO and OPTIONAL TO DO lists. A pity but a girl has her priorities. Then as Size15Stylist said: it was country time ! We were lucky to meet and befriend under a bright and hot summer sun. My guess : a special order for her birthday. Looking forward to see you again soon. Although maybe we should consider asking somebody else to carry the fries when we go for meet & greet next time. And those fries! #sostartruck! I'll return the favour in March!